It’s hard to believe our little Caroline just had her three month birthday. Time sure has flown by since she entered our lives last July. It has truly been a blessing and a joy becoming parents. Nathan and I have loved seeing her grow and change over the past three months. We look forward to much more growing and changing over the course of her first year and further into the future. We have been blessed with a great sleeper! Ever since Caroline was a month old, she would routinely sleep at least a five or six hour stretch each night. When Caroline was two and a half months, she had a period of sleeping a full eight hours a night! I joke with Nathan that she knows Mommy has to sleep to be able to do her job, so she is already helping Mommy out! Our little girl continues to be very social. She loves to smile, chat and when she giggles; our heart melts. Caroline has also become quite the traveler. So far, she has done very well on all the trips across the country. 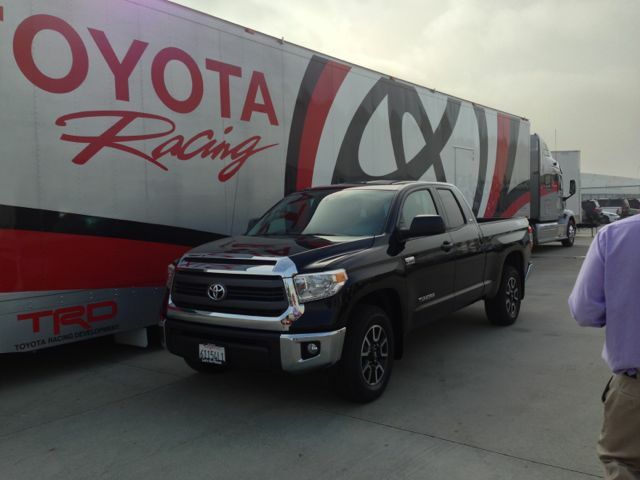 Currently, we traveled to Oceanside, CA for the Toyota Triple Crown Finale. 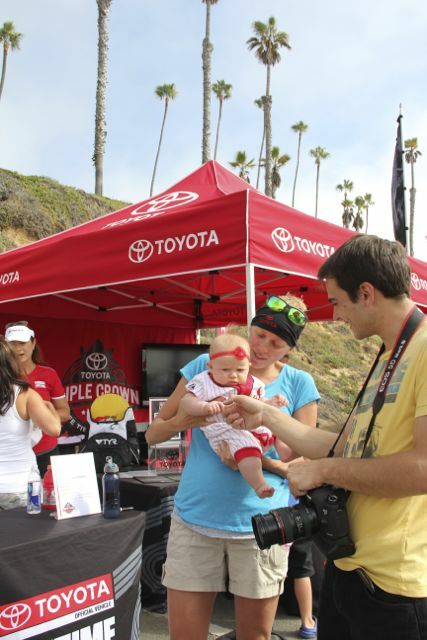 I will not be back to racing yet, but I will be hanging out at the Toyota expo and cheering on all the athletes race morning. 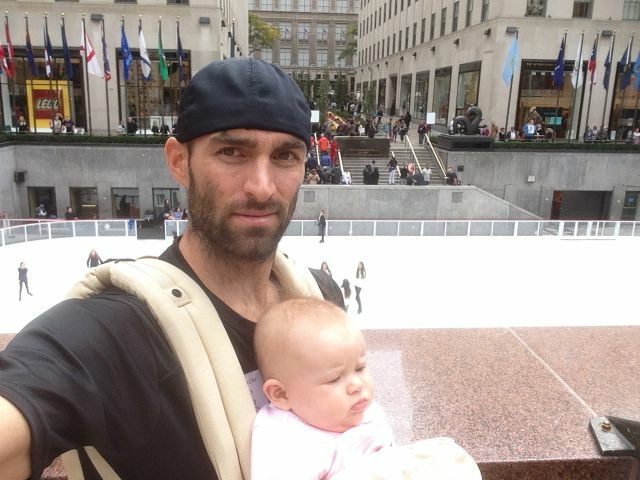 Flying without race gear is much, much easier; however, the real travel challenge will begin next year while traveling with race and baby gear!! After the Oceanside race we drove up to Torrence, CA for a reveal of a triathlon vehicle that will be showcased during SEMA next month in Vegas. Our biggest challenge as of yet was flying from LAX to Newark and then flying from Newark to St. Louis the following day. Little Caroline has already gotten in some epic frequent flier miles. In New York City on Tuesday, October 21st, I was a spokesperson for the reveal of the Marathon Sports Bra created by Champion. New York City is such an awesome city to visit and although we were there for a short 20 hours Nathan and Caroline where able to go around and tour at Rockefeller center. The past month, I have also been back to a routine of training. I have slowly been building up a little speed in my running and building up volume on the swim and bike. My cycling has been coming along very well and I feel this discipline is the closet to my “race” fitness. My swimming and running are coming along a little more slowly, but I am really enjoying the process of getting back some speed. I am able to push the volume and speed in the pool as much as I wish. In my run training, I have to slowly build back with the speed and volume in order to keep my ligaments and tendons feeling happy with the six month break from running during pregnancy and post partum. I have also included 2x a week of an intense Pilates class, which has really helped my flexibility as well as my strength. The class is taught at Lifetime Fitness and is packed with many women who are aged a young 50 and older….and are much better at Pilates than me and Nathan. Needless to say, we are impressed and improving each week ourselves. We have been training in St. Louis this fall and have enjoyed the very warm September. With a long break from riding outside, I have loved getting out with Nathan on the roads and climbing all the steep climbs in the St. Louis countryside (fortunately Grandma can watch Caroline). We were also invited to participate in Pedal for the Cause on October 6th. This was a fundraising event to help with cancer research and all the donations remain in St. Louis. Nathan and I chose to ride the 25 mile route and ended up doing a few extra loops on the ride since it was such a beautiful route and inspiring to see so many cancer survivors and supporters out on the road riding for a great cause. I had the opportunity to travel to Colorado Springs and speak at the International Altitude Symposium. This is organized by Randy Wilber, Sports Scientists at the Olympic Training Center. It was an honor to speak alongside Susan Williams, as she talked about her altitude training preparation for the 2004 Athens Games and I spoke about my altitude training preparation experience before the 2008 Beijing Games. We also got a chance to see many of our Colorado Springs friends and visit the Olympic Training Center, where it is like a family for us. Hard to believe it was nine years ago, Nate and I met…! It was wonderful to have everyone meet little Caroline! We will be back in Colorado Springs November 8-11th, as I will be helping out with a Junior Triathlon Camp. October was a month filled with travel for us, but we are headed back to Florida in November for a training block to get ready to race next season before the Christmas holidays. It feels great to get back into some quality training and I know the real work is yet to come. I have much more motivation in my training these days….all I have to do is picture the smiling face of my little girl. As the end of the triathlon season wraps up, I wish everyone a fantastic finish to their season. Enjoy the off-season and heal up any injuries, mentally refresh and recharge for an even better 2014. 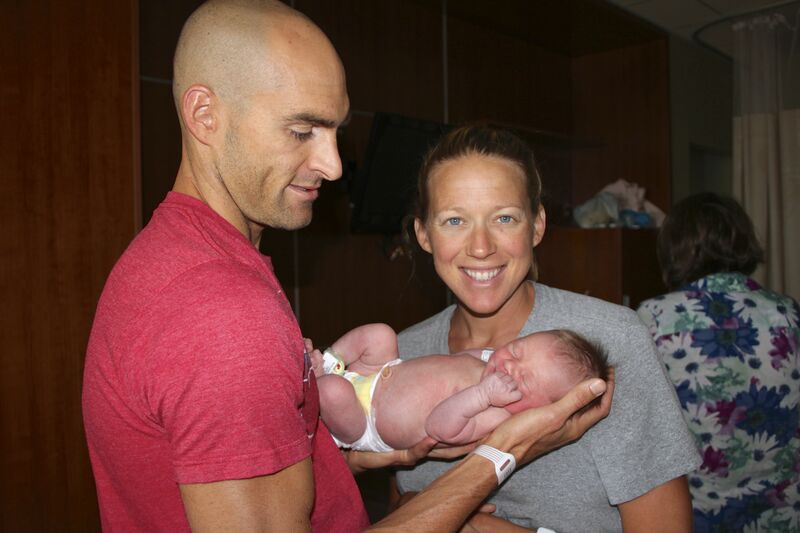 Sweet Caroline arrived into our lives on July 18th at 8:27pm! She was already showing her personality by arriving eight days late, but she was born healthy at 7 lbs 3oz and 20.5 inches long. The night before Caroline was born, I started going into pre-labor with my water breaking at 11:30pm on July 17th. I wasn’t in active labor at that point, so I attempted to go back to sleep. I only managed a few hours of sleep; mostly due to me being anxious about what was more than likely going to happen the next day. At 6AM the following morning, I called my doctor and he advised me to head to the hospital. I still wasn’t having any strong contractions, so my husband and I took our time packing for what we anticipated to be a long day ahead! I arrived at the hospital and was advised that this baby should be born within 24 hours of my water breaking to avoid infection. This would mean that the baby would be born before midnight. Around noon, I started going into hard labor and later that evening, she was in our arms! My labor experience was more painful than any triathlon I have ever competed in from the hours of 2pm to 5pm (I received the epidural just after 5pm and it made the labor experience amazing…thank you to modern medicine!). Caroline had the cord wrapped around her neck, just like her mother when she was born. She had to have the cord cut a little early, so that she could make her way out into the world. Since Caroline has been born just over five weeks ago; she has been eating like a champ. She gained 3.5 lbs in her first month of life and grew 2 inches. It is amazing how much little babies learn in their first month of life and what they continue to learn. 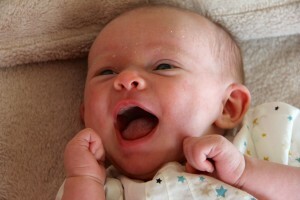 She is already more alert, smiling, and cooing. Soon enough, she will be talking her Daddy’s ear off! When we put Caroline on her tummy, she likes to lift her head briefly and try to crawl. After two weeks, I started back into light exercise. I was not ready to attempt running, but swimming was a great activity to get back into. The first swim felt amazing, even though I was sleep deprived. It felt awesome to move the body, since I was so tight from the hours of breastfeeding and from labor. I also felt amazing moving the non-pregnant body through the water. I was used to swimming with an extra 15-20 lbs. in my belly and it felt weird to have instantly much less drag! I also forgot how much my aerobic capacity was compromised during pregnancy. 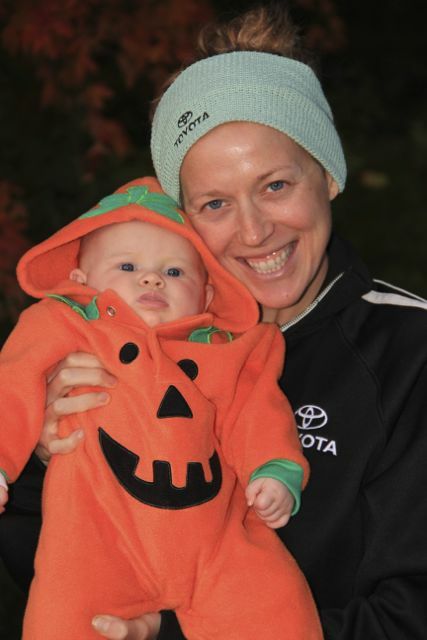 From six weeks of pregnancy onward, it felt as if I was always training at 15,000feet above sea level. It was refreshing to have my normal breathing back in place! Just after two weeks, I was surprised how comfortable my ISM bike seat felt. I wasn’t sure if I would be sore, but I have been able to consistently ride since day 16 post delivery. The run a little longer than the swim and bike, but I suppose that is to be expected. I had not run close to 16 weeks, and I started off the running much like I finished the running during pregnancy; running only uphill. Around four weeks, I felt recovered enough to resume running on a flat terrain. Training between breastfeeding and taking care of Caroline has caused me to use my time management skills to the max! I am now very focused when I have the moments to train and even more so enjoy the moments with Caroline after I have completed my work (workouts) for the day. My rate of training improvement over the past two weeks has been the most significant in my career! I suppose when you start at an unfit state you have lots of room for improvement. I am looking forward to building my fitness and getting back into the routine of training. Caroline started sleeping better around one month of age, so that has greatly affected how I feel during my workouts as well. I am keeping my fingers crossed that her great sleeping keeps up! She typically goes to bed at 9:30-10:30pm and wakes up between 1:30-2:30am for a feeding and then wakes up again between 4:30-6:00am. I think that’s pretty good for a one month old! 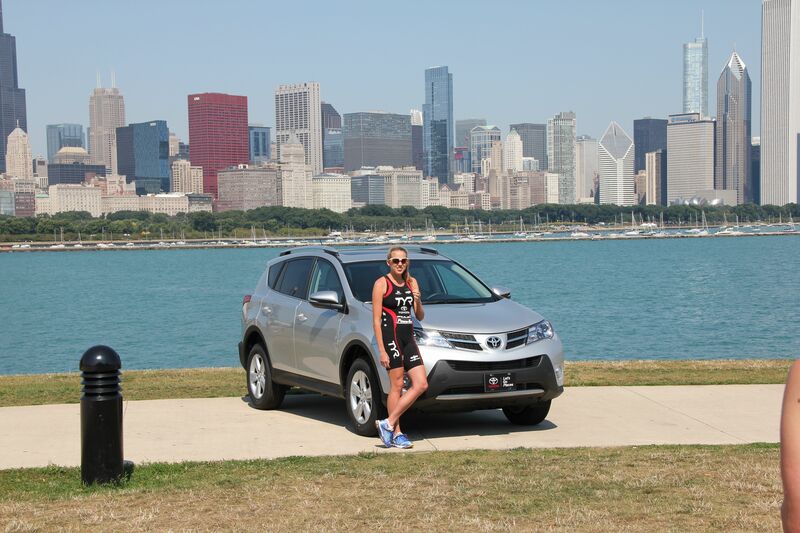 We headed up to Chicago last weekend to represent Toyota and hang out at the expo. Thankfully, Caroline enjoyed her hotel room and slept well! It was great to be back to Chicago, as it is such a beautiful city. 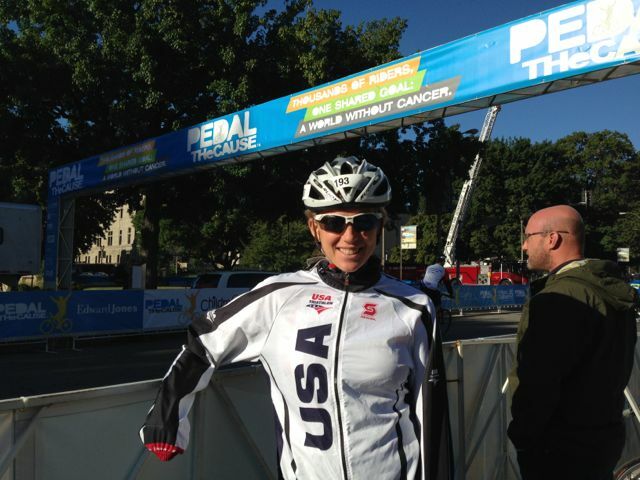 It was strange to be there without the race jitters, but I hope to be back racing in the Windy City next year. We stopped to buy a baby carrier at Babies “R” Us on the way up to Chicago and I was pleasantly surprised there was a private nursing room. Good to note for our next trip….map out the Babies “R” Us on the way! Just over three months ago, I wrote earlier that Toyota did a shoot in St. Louis, Missouri. 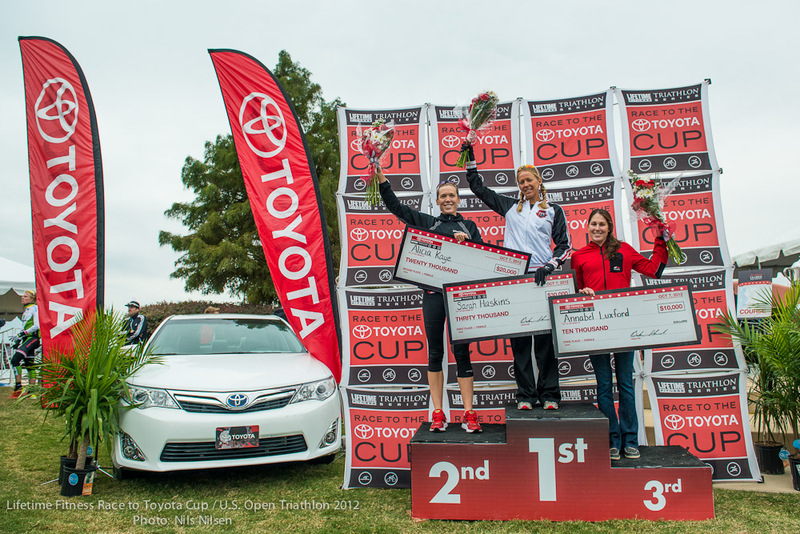 Since then, Toyota has created several different commercials with the Team Toyota athletes. The commercials all have a different message; whether it be a training tip, motivational tip or words of encouragement. Sometimes all you need is a little extra motivation to get the most out of your workout! I am down to the final two weeks of my pregnancy (unless she decided to hang out a little longer than her expected due date!). Every day, I can tell that she is getting bigger and is has less room to move around my stomach! It’s so surreal that I will be able to hold her in my arms in just a short amount of time. I have been feeling good and still been able to get in some aerobic exercise. I typically get in around 3000meters of swimming, 30 min on the elliptical, 20 min of strength training (Monday/Wed/Fri/Sat) and on Tuesday/Thursday/Sunday an 60-90 min on the bike trainer. I adjust day to day with how I am feeling, but it does feel good to continue to move the body. It’s been also nice to spend the summer doing things I have not had the opportunity to do over the past ten years while I have been racing. I took a trip to Innsbrook resort in St. Louis, MO, been able to hang out at the pool for pure leisure swimming and not training, and watch other’s race while I have been a spectator! Nate has been doing several local races in the area and I have been on camera duty! I has been a nice switch and a relaxing change of pace. Next weekend Nate is racing the 5150 at the Innsbrook resort. We plan on being there (as long as the baby doesn’t make an early arrival!). Nate and I had the chance to take some pictures around the farm. We look forward to sharing the maternity pictures with our daughter some day! I hope everyone is having a great start to their summer! Stay cool and race hard! 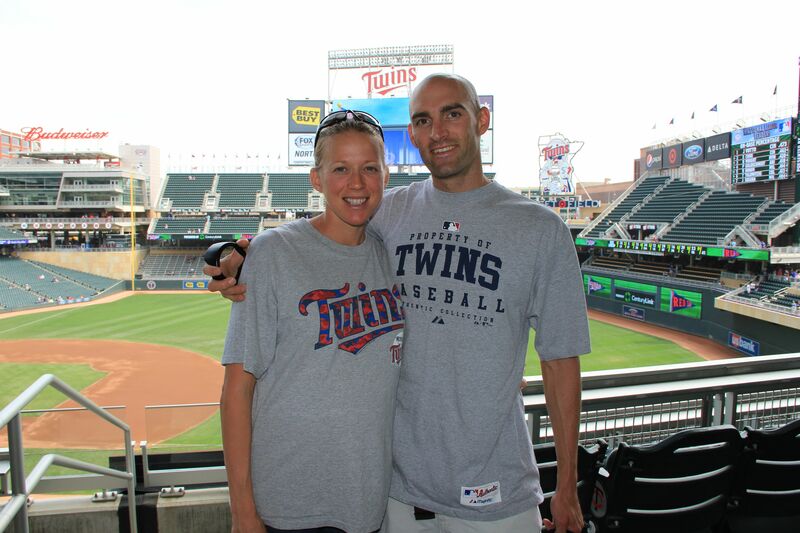 Summer is quickly approaching; and that means one thing…baby will be here soon! This past month has been very busy with triathlon clinics, visiting family and friends, and a few upcoming travel trips. The month of May began with a guest appearance at Parkway Central High School. 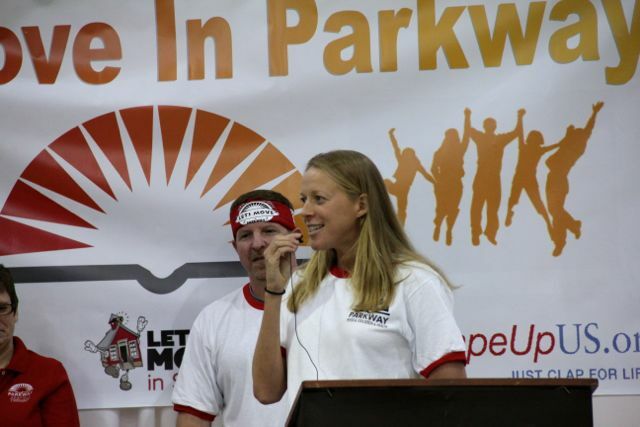 I was the honorary speaker in the, “Let’s Move in Parkway”, day on May 5th. I pepped the kids up with an opening speech about my start in Parkway and how exercise and healthy eating has been the core platform to my current profession and lifestyle. I like to remind kids that my love to sport began in the Elementary PE class with the annual mile run. I loved the challenge of improving my time year after year and it motivated me to begin run training shortly before each mile run. After the speech, I helped lead the kids through a mosh pit dance (yes, although seven months pregnant, I could still manage the moves…although not very gracefully)! The rest of the afternoon, I enjoyed seeing the healthy initiatives for kids at the various expo booths and games for kids in the gymnasiums. Everyone seemed to be having a great time! 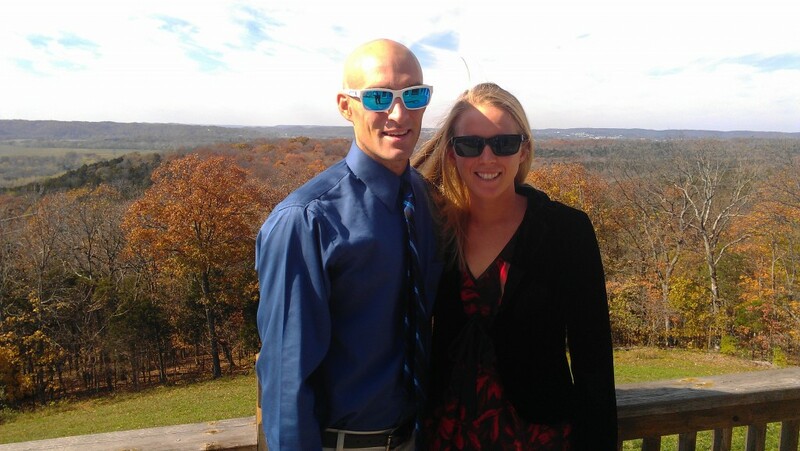 The following weekend, Nate and I had to opportunity to work with adult triathletes in New Town, Missouri. We helped calm many first time open water swimmer’s fears; not just about the open water, but also about swimming in a wetsuit! Nate and I shared our tips on how to navigate the open water efficiently and comfortably. We finished the morning with a transition clinic. Nate was the demonstrator as my bike mounts are my weakness while not pregnant! With my vertical jump being about one inch right now, I don’t think I could make a pretty mount or dismount the bike! We had a good time sharing our knowledge and tips with the community. We have another clinic planned at New Town on June 8th. The water should be much warmer by then, since this spring has been exceptionally cool. This past month, I have had a few changes with my training. Right around the 28th week, the running began to get quite uncomfortable. For a couple of weeks, I modified my run training with uphill running on the treadmill. However, I found that at times the uphill running also became uncomfortable and I realized how comfortable the elliptical was in comparison. I decided I did not want to risk pulling any ligaments or causing unnecessary pressure, so I am sticking with the elliptical machine for 30 minutes about 3-4 times per week to take place of my jogging. Although I do miss getting outside for some fresh air and running through a trail or two, the elliptical machine is able to provide a cardio workout without the bouncing and the stretching. Soon enough, I will be able to swim outside again, so my current 100% indoor training (with trainer riding/ indoor swimming/ gym) will modify with the outdoor sunshine in the pool. I have also been battling a cold for over the past week and a half. I think getting a cold while pregnant seems to be amplified compared to my non pregnant self. It started with a mild sore throat…sneezing…major sinus congestion….coughing. I believe I am finally in the last stage of the virus and will be very happy to retire the tissue box. The mild coughing over the past few days has left my lungs a little sore and that is compounded with the fact baby girl is pushing up on my diaphragm. The end of the month Nate and I will be doing a bit of travel. 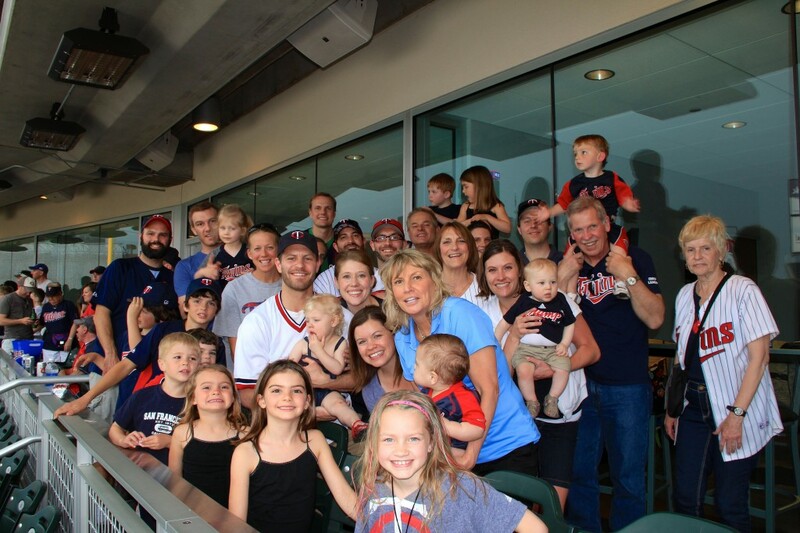 We spent May 17-21st in the Twin Cities, enjoyed an authentic German restaurant, baby shower, my mother-in-law’s retirement party at a Twins game suite, and lots of family visiting. The four day trip was busy and action packed! We had a great time and met our newest nephew, Mattias Jon Kortuem, who is just one month old. It was precious to see him and realize we will have a little one of our own in just a few short months. 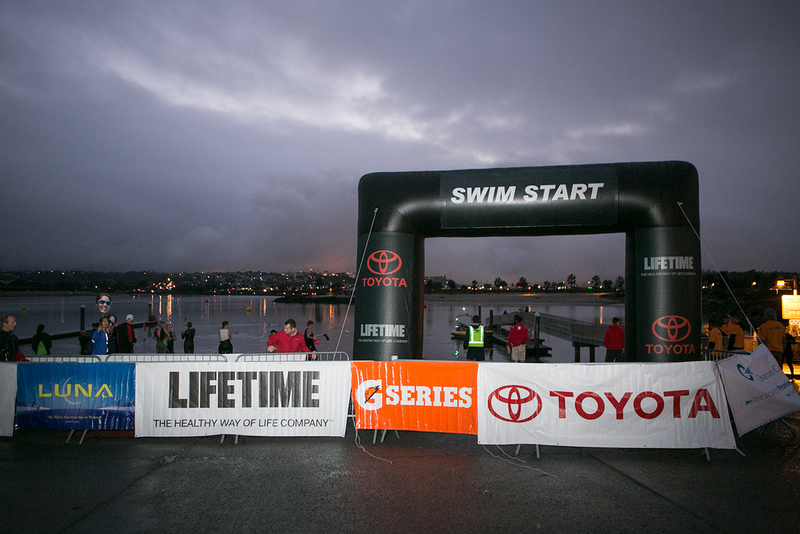 Next week we depart for a driving trip to Austin, Texas to work at the Toyota booth for the CapTex Triathlon. The past few years I have raced in Austin, Nate and I have really enjoyed the city. Although this is a “work” trip, we will take it nice and relaxed as possible. We are planning to break up the twelve hour drive in two days, since I will be close to eight months by then and don’t think sitting in the car for six-twelve hours straight will scream comfort! This Memorial weekend is the official kick off for summer, so I hope everyone enjoys some time at the pool or at a picnic or just relaxing with friends and family! I have entered my last trimester of my pregnancy! Hard to believe that our little baby girl will be here soon. I feel her kicking often, although it”s mostly at night or after dinner as I”m relaxing on the couch. This past week we have moved base from Florida to Missouri since I will be delivering in St. Louis this summer. We loved our time in Florida this winter; not only getting to avoid the snow, but also enjoyed swimming outside, running in shorts and taking a few trips to Disney. Missouri is now in full blown spring; which means one day of 80 degrees and the next day 50deg and rain. Full blown summer is right around this corner. In Missouri, we are enjoying catching up with friends, visiting family and preparing for childbirth with our classes beginning very soon! I have still been feeling great for the most part in my exercising. As I enter my 28th week, I take my workouts day by day. I have typically been able to complete around two hours of aerobic activity a day; averaging three-four swims, three bikes (on the trainer), and three to four runs per week with a couple strength training sessions thrown in the mix. A few times on my runs, I feel round ligament pain, but it”s only been a handful of runs over the past couple of months that I have had to stop and walk. Most runs, I feel great and able to run 3-8 miles. All my exercising has been low/ moderate to high end aerobic and I don”t worry so much about pace, just getting out and moving the body. It feels great to get the heart rate pumping and enjoying a break from a typical rigid training schedule. Since we have been back in Missouri, we have been busy! Last weekend we ran a swim clinic at Parkway West High School. We focused on open water skills with the triathletes and practiced drills the swimmers would be able to use in their training leading up to their triathlon season. 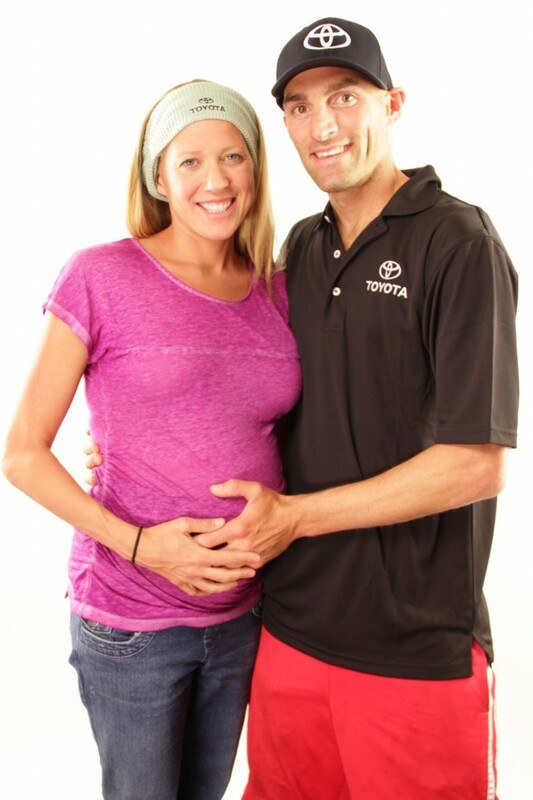 After the clinic, we had a two day shoot with my sponsor; Toyota. The filming was focused on two parts; a Mother”s Day Special, and a Triathlon Tip Message. 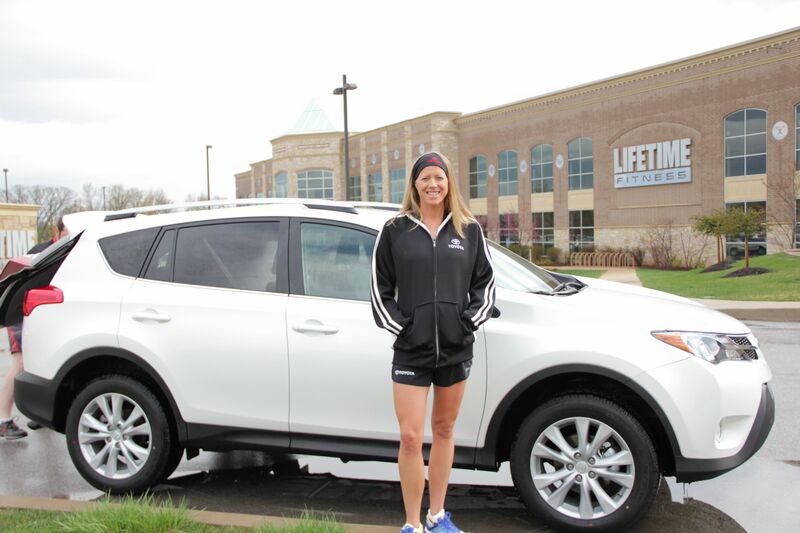 The videos will be run on Toyota”s website and also at the Lifetime Fitness Clubs nationwide. What was so different about this shoot, was that I got the opportunity to work with my family. My mom got to experience some interviews under the lights and enjoy a professional makeover! I am really excited to see the finish product, as everyone worked very hard on the shoot. The video will be out next month! This year has been a little different start compared to the last eight! As normal, I am back at my training home of Clermont, Florida and enjoying the beautiful winter. Different from normal, I am not in the pre season hard training push! Currently, I am entering my 19th week of pregnancy and enjoying the time to simply exercise to stay fit; both for myself and my baby. The past eight years I have really learned to become in tune with my body and listen to it. That skill has been a valuable help over the course of the past four months. 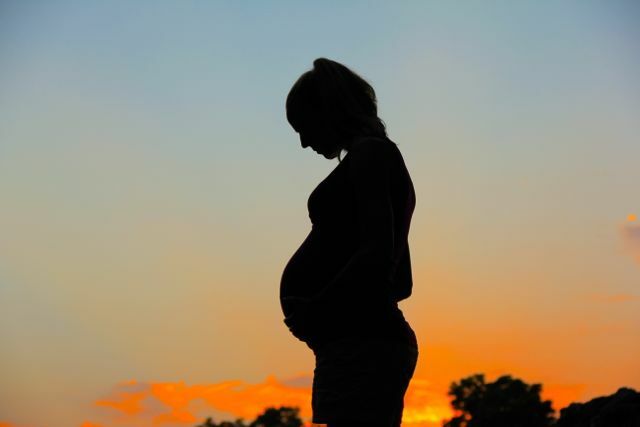 The first trimester went rather well, compared to stories I have heard from other women! I didn’t have too much morning sickness, with the occasional “evening queasiness”. I learned to tailor my eating to larger breakfasts and lunches, so that my stomach would be happy with smaller dinners. This past month, I have officially entered my second trimester, and with that comes a lot of growing! Right now, I do have a visible bump (although it looks much smaller than it feels!). I am still able to swim/bike/run/strength train comfortably. I have slowed down over the past couple of months and don’t push above the aerobic zone. I learned early on in the first trimester that if I did a little too much exercise, I would pay for it the next day with too much fatigue. So far, I have been feeling good with averaging around two hours of aerobic exercise per day (usually 2 of the 3 disciplines). I know that every pregnancy is different and each women has to listen to how her body is feeling. For me, I noticed how high my heart rate can spike with exercise (especially swimming and running), so I have learned to embrace movement without worrying about pace. I haven’t run with a watch in two months! While I will not be racing this season, my husband, Nate, will return to the racing scene. He finished his last race as a pro in 2007 and this year will race in the age group or elite age group division. It has been a fun experience getting to accompany him and cheer him on at local 5k’s and duathlons…soon to be the full triathlons! Nate is planning on racing a local race in Clermont at the end of March and then several 5150’s this spring and summer. We are also planning to stay active in the triathlon community with getting involved in camps and clinics around the US. We are hosting our first camp in Clermont this weekend. At the beginning of April, we are attending a USAT Youth Development camp in Chattanooga, Tennessee. We will also be hosting various camps this spring and summer in the St. Louis area. We are looking forward to the opportunity to be able have the time and energy to use in other areas of the sport, since I won’t be putting forth the energy in racing in 2013. My due date is July 10th, 2013! Four months down, five to go…and I know that the months will creep up faster than expected (with the exception of months 8-9). We are very excited about our growing family and can’t wait to meet our first child. Lot’s of changes in store for the Kortuem household! I have always had a dream of becoming a mother and feel so blessed that motherhood is upon me. I know Nate is really excited about becoming a Dad! We find out very soon if we are having a boy or girl, which will make everything seem so very real. 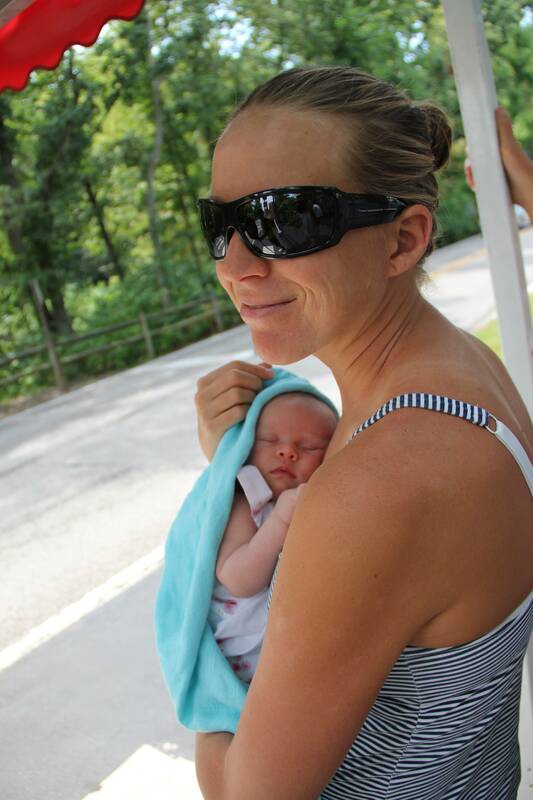 This summer I will enjoy getting adjusted to our new addition and as soon as I feel ready, I will be back at training in preparation for the 2014 race season. Although I won’t be toeing the line this year, I look forward to being on the sidelines and experiencing the role as supporter and cheerleader! See you at the races! 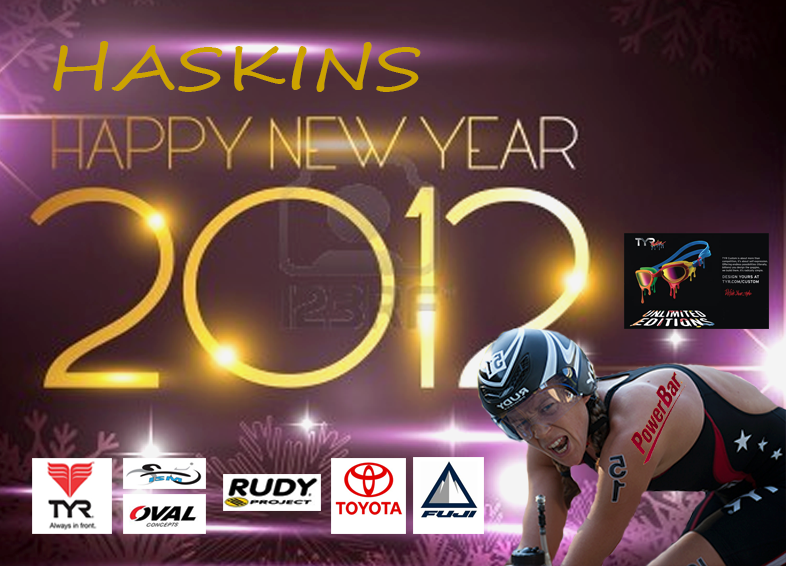 HASKINS HAPPY NEW YEAR GIVEAWAYS! Free Giveaways Every day to ring in the New Year!! Do you want to celebrate the New Year with a Bang! How about A Bang with Lots of Free Give Aways? From December 26th until January 1st, I will be giving away tons of free product everyday from each of my sponsors. In addition, I have teamed up with Andy Potts and Cam Dye who will be giving away items at the beginning of the month(Check out their FB pages for more info). So, you will have the chance to win something for every day of the month of December! Next, check out my FB page from Dec 26th until January 1st to win a different prize every day. Below is a schedule of prizes but make sure to check in as I will have some ‘surprise’ prizes as well! My 2012 race season has officially come to a close. Looking back over the season, I feel the focused training began in December in St. Louis, but the really difficult training began back in January in Clermont, Florida. The winter/springtime training is one of the toughest times of the year physically; when you are pushing your body in training to get the most out of your body later on in race season. The hardest part of the season mentally is just before those key races. This season was my eighth year competing as a professional triathlete and I feel it was my best season to date. Looking back on this year, I can’t forget where it all started; back in 2004 racing an ITU race in Tempe, Arizona as my first Pro race. My first triathlon however, was back in 2003 in St. Louis, Missouri. Remembering that first race back in 2004, it’s wondrous how much I have learned not only about the profession of the sport of triathlon, but also about myself. Every year I have continued to learn more and more about how to become a better athlete and strive to be a better person. I suppose that is what experience is all about; becoming more wise and building upon the foundation of knowledge acquired in youth. Back in 2004, I had the fundamentals that drive someone to keep after their goals and dreams. I raced with passion, heart and determination. I loved the raw emotion of racing and getting the best out of myself. Today I embody all those characteristics, but I have grown in many aspects. One of my biggest growths is taking personal responsibility for getting the best out of me and listening to that inner voice. That inner voice is key for an athlete to be able to back off when the body really needs time to heal or know when it’s okay to keep pushing through and trying to find that perfect balance. The more the years go by, the more you realize how little you do know, but moving forward I am striving to continue to learn and improve. That first Pro race back in 2004, it was my first open water swim, first time getting on my bike with my cycling shoes already on my bike (it took my several minutes to get going out of T1!) and my first draft-legal triathlon. That first race was tough, as any triathlon should be, but it was the starting point for me. I would not have imagined back then everything I would have accomplished since that first race; including all the highs and lows that are part of sport and all the life lessons learned on and off the race course. Looking back over my 2012 season, I had many highs with one notable “low”. Looking back, I don’t really see my “low” (missing the Olympic Trials with my 8th place finish in the WCS San Diego) as a failure. Although I fell short of my goal in missing the Olympic Team, that race was the hardest I pushed myself all season. Knowing how hard I pushed both mentally and physically in that race, in the preparation leading up to the race and in the race itself, I can’t consider it a failure or a “low”. I simply did not accomplish the number one specific goal, but that does not mean other goals were not accomplished. Of all my races this season, I am the most proud of my performance in that race. I left nothing out on the race and attacked that race 100%. Yes, I may have made a couple of tactical errors, but so many aspects of that race were positive. I did not start on the line in London, but I had the opportunity to race at home on US soil in the non draft format. My strength is in the non draft racing and I was able to have one of my most successful seasons ever, with eight wins. A triathlon race is never easy, it’s not supposed to be, but expecting the most out of myself race after race is one of the toughest parts. I fully appreciate each and every one of my wins this season. Each time I get to that start line, it’s not the single efforts of myself. I have a whole community of people who I rely on to help me get to the start line and compete. Just like in any profession, the more you embrace other’s knowledge and help and the more help you give back to help others; the more you will be successful and grow. To try and be brief is tough, but I want to recognize those who have helped me this season and who I hope to be able to give back to as well. Triathlon is such a mobile sport, I don’t feel that I have one home! I always feel I have that hometown support in Colorado Springs and Clermont Florida as well as in Missouri and Minnesota. I can’t quite list everyone who contributes to my 2012 season, so those of you not listed know that you are appreciated. OTC: 50 meter indoor training pool, food services, training rooms and sports medicine (Flower, Dustin, Amber, Dr. Moreau and Sheri). My loving, supportive family! Mom and Dad for giving me the opportunities back when I was five to start swim team and still supporting me at 31. LIfetime Fitness Clubs: Proving places to train when I am visiting over the holidays when it’s usually zero degrees. Family and friends: Thank you for supporting Nate and I on our journey. We look forward to the future memories at Lake Elysian and winter holidays. A special thanks to Joe Santos from Davis Wheelworks who is always there to help with any bike related need and helping me achieve my goals. I also want to thank my agent Amy Stanton and Stanton Company for all their support and hard work this season and season’s past. I especially want to thank my supportive sponsors, who I am proud to represent on and off the race course. Last but not least, my coach/bike mechanic/”bag carrier….as he calls himself”/the usual cook in the household/training partner/spider killer….all wrapped into one…my loving husband; Nate. Thank you all for helping make 2012 a success. I look forward to the future everyone…one day at a time! The weekend of October 19th-21st, I had the opportunity to help seven women prepare for and compete in the SheRox San Diego Triathlon. The preparation for this race did not start this weekend, but back in July when I first met the women in New York City to help them on their triathlon journey. Each of these women are editors for various magazines and are always giving us helpful tips on how to live a more active, fit and healthy lifestyle. I may not know much about fashion, but triathlon is one area I can help these magazine editors with a few tips. Nate and I arrived on Thursday to beautiful, typical southern California weather, but that was all to change for the weekend! On Friday the editors, Toyota PR (Sona and Jaymie) and I all went out to dinner in downtown San Diego. Sona and Jaymie treated us all like queens and we had an amazing meal family style. First, second and third course meals were filling the table bowl after bowl. The food was fantastic, but it was a great opportunity to connect with everyone and catch up since our first meeting in July. The Saturday before the race, was a day filled with training sessions, course talks, and more great meals. Nate and I went over the transition set up for race morning and then headed to the beach for a swim warm-up. 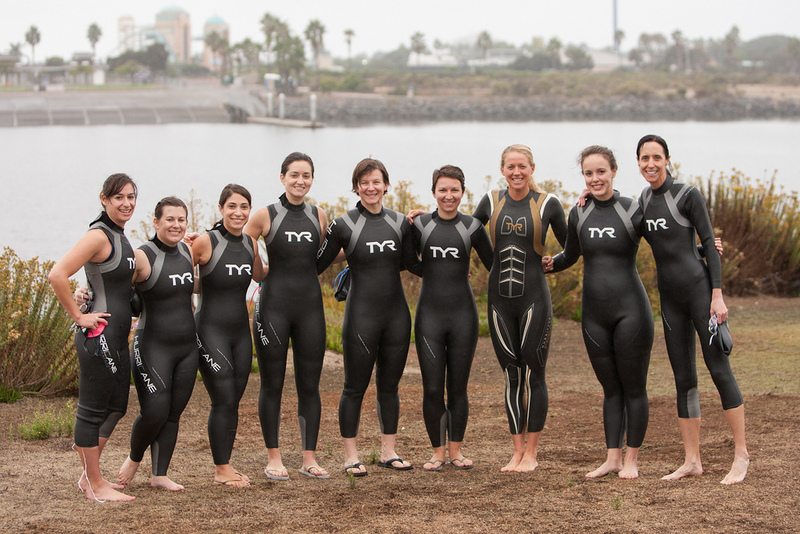 For many of the women, they had only practiced getting into their TYR wetsuits once prior to the warm-up! Needless to say, we had lots of laughs, trash bag “rippage” and worked up a sweat getting the women situated and zipped. 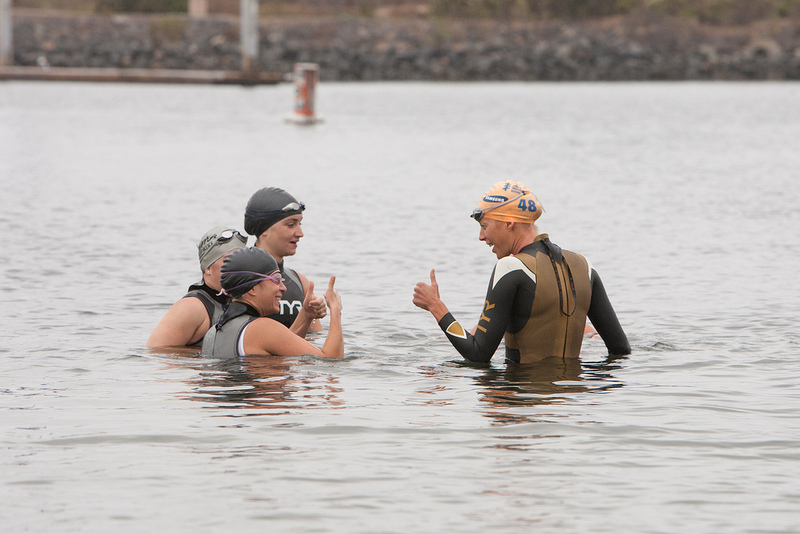 Once we got into the water, the women were so glad to test out the wetsuit and swimming in the waters of Mission Bay. Open water conditions can be so different race to race and that’s why I feel it’s so key to be comfortable, especially if one has limited open water swimming experience. The women practiced swimming around buoys, staring in deep water and also conquering their fears of open water swimming; whether it be anxiety about the depth, crowded swimming space or the “creature’s” below! About ten minutes before race start, they sky began clearing and I saw a ray of sunshine. It was going to be a great day! 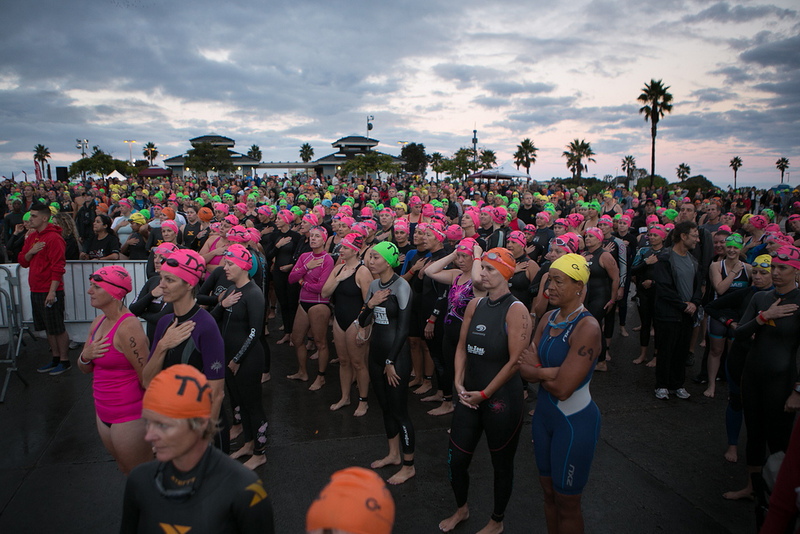 One really cool aspect about the race is that it was a women’s only race, so it was so awesome to see 1200 women of all ages competing in the sprint or supersprint tri. For more than half of the women, it was their first triathlon. As each wave of women crossed the timing mat to head down to the water, I was able send along some positive energy by giving the women high fives! It is rare that I get to cheer and watch a race, since most of the time I am always racing! I throughly enjoyed the shift of focus and spent the next couple of hours cheering on the seven women I had been mentoring the past few months, along with all the other women participating. 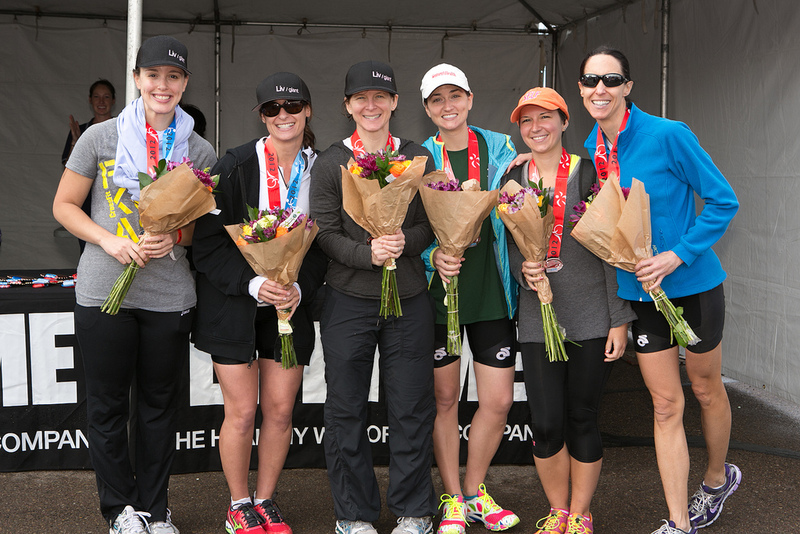 After the race, the women were all smiles as each had accomplished their goal. 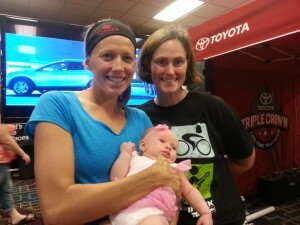 Most women mentioned to me that they were excited to compete in another triathlon in the future! Amanda from Self magazine had won the Editor’s Cup Challenge, posting the fastest time amongst the seven women. 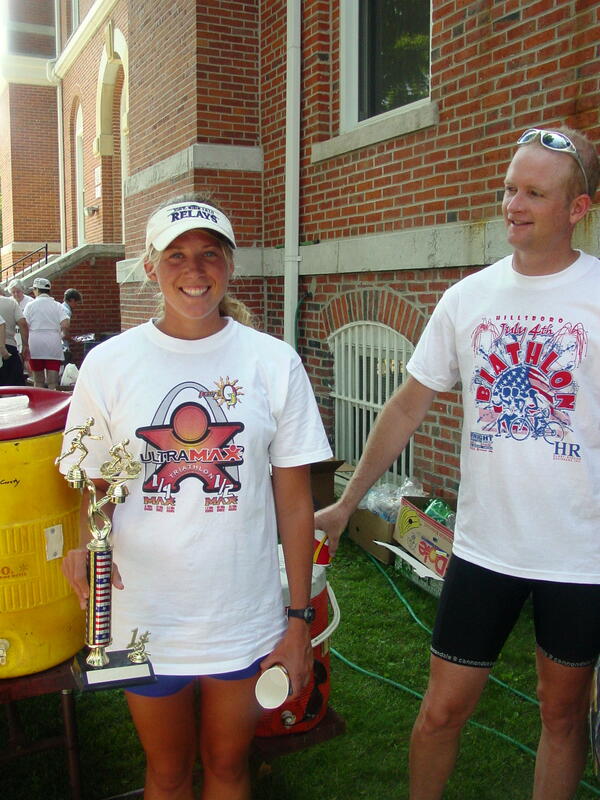 She had quite the trophy to take home, definitely one with character. Hopefully this tradition will continue and more trophies can be earned in years to come! All and all this was a great experience. I learned from the women a little about life as a magazine editor and hopefully they learned a thing or two about life as a professional triathlete. Most importantly, I realized whether you are a seasoned age grouper, pro or first timer; everyone goes through those same emotions before, during and after a race. We may have different race specific goals leading into the race and on race day, but those raw emotions are the same for all of us! So, that saying may be true in this case….we are not really all the different after all! The day after my race in Minneapolis, I headed to New York City for an opportunity to meet with five editors/bloggers who all have one common goal of competing in the SheRox San Diego race on October 21st. I was excited to share my knowledge of triathlon with the women and help prepare them as they began their training programs. The event took place in Chealsea Peers in Manhattan. It had been almost five years since I have been to the gym; as the last time was when I was in town for the New York City triathlon. The gym is a must to work out if you are ever in the city. The pool has a great view overlooking the river and it’s complete with a 400 or 200 meter banked track, beach volleyball, tennis, cardio equipment and a very high rock climbing wall. I was tempted to try the wall, but figured I should hold that plan until the off-season! The women were all very excited, although most were a little apprehensive about the open water swimming portion of the triathlon (as that is normal for most preparing for their first triathlon). I gave the women an hour crash course of triathlon 101 with what gear they will need, how to train for each of the disciplines and transition tips. After the talk, I had a couple hours to spend with the women on running and swimming drills/techniques. 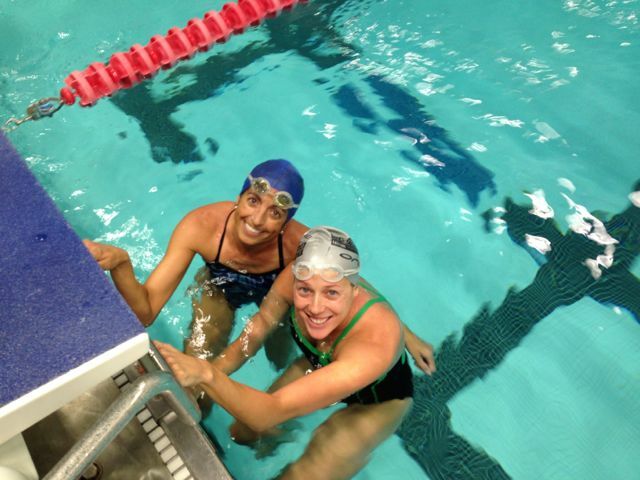 It was fun to help share ideas and tips from what I have learned over my years of swimming and running to help them incorporate into their daily training. Over the next three months, I will be helping the women prepare for the event and be with them in the few days prior to the event in San Diego. I am very familiar with the race location as the women will be competing very close to where I competed in the Olympic Trials last May. My sponsors; MissionAthleteCare, Sampson Sports, Rudy Project, ISM, and TYR have been very generous to help out and provide the women with gear to help them along the way. The women will also be writing about their experiences, so look for their articles in Self, Women’s Day, Glamor and many more outlets. 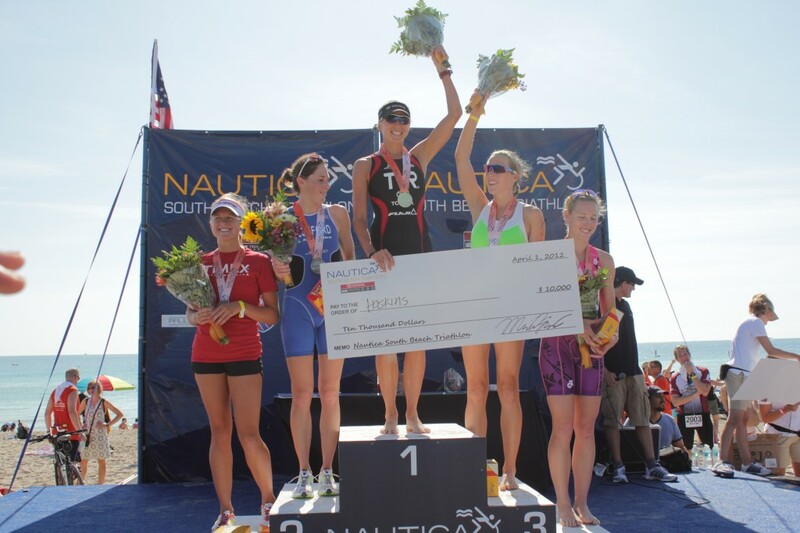 It was inspiration to see women take up the triathlon challenge! I know I will learn just as much from these women as I they will learn from me!